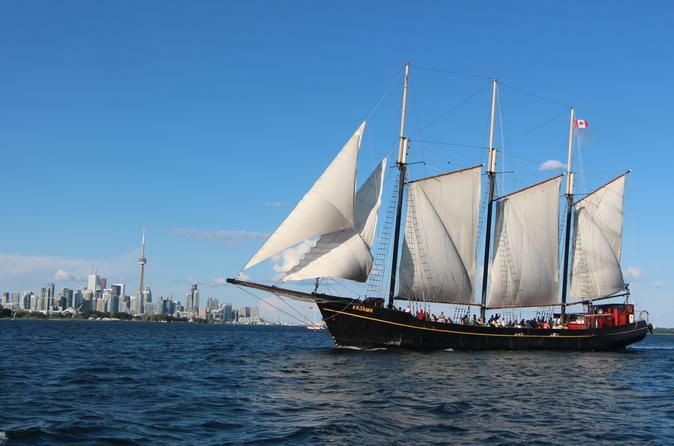 This is your chance to experience Toronto's only tall ship boat cruise! Sail aboard the 'Tall Ship Kajama,' a traditional 165-foot, 3-masted schooner boat, and sit back and relax with a cold drink from the bar or order from the restaurant. Cruise along Toronto Harbour and beautiful Lake Ontario. Set sail on the Tall Ship Kajama from the heart of downtown Toronto. This is a 2-hour experience that includes 30 minutess at the start of the tour boarding the vessel. After setting sail, you can help your experienced crew raise the raise sails on the 3-masted 1930s schooner. If you don't wish to partake, no worries; just sit back and relax with an ice-cold beverage from the fully licensed bar. Sail either through the east or the west gap of Toronto's beautiful harbor. Take some pictures of the Toronto Islands and the downtown skyline, and take time to explore the historic sailing vessel. After the sails are up, your crew will sing a couple of sea shanties while coiling the ropes. Midway through the cruise, they'll fire off the ship's cannon, which is always a crowd pleaser! Once out of the gap you will be fully under sail. You can ask the crew questions about the vessel's history, the surrounding areas or just sit back and enjoy the background music that is played while you take in the views. You can also order some typical pub food from the onboard restaurant. After 1.5 hours on the boat, return to the dock, where you are able to purchase a souvenir photo of your excursion.